Oriental Orthodox Churches: Six Bishops Consecrated for Armenian Church. 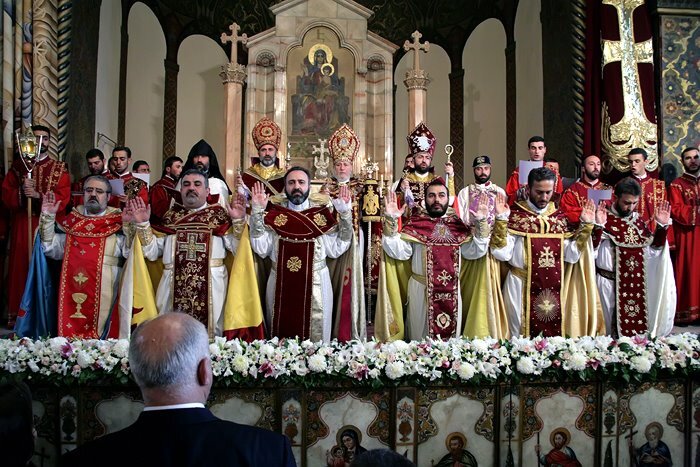 Six Bishops Consecrated for Armenian Church. 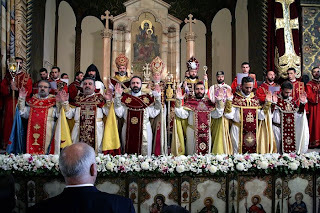 On Sunday 6 November 2011, Holy Liturgy was presided over by His Holiness Karekin II Supreme Catholicos of all Armenians at the Cathedral Church of Holy Etchmiadzin. During the celebration 6 vartabeds (celibate priests) of the sister Armenian Orthodox Church were consecrated as bishops. His Eminence Archbishop Mor Cyril Aphrem Karim represented Universal Syriac Orthodox Church the celebration. During the Divine Liturgy and after the consecration His Holiness the Catholicos delivered a sermon highlighting the importance of the hierarchy in the church and reminding the new bishops of their duties as persons of prayers and preachers of the word of God. Following the celebration all were invited to a banquet organized by Echmiadzin in honor of the new bishops.